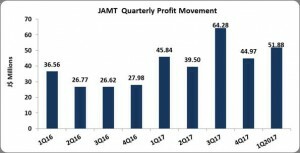 Jamaica Teas (JAMT), for the 3 months ended December 2017, reported revenue for the first quarter ended December 2017 of $456.15 million, an increase of 22% compared to the $373.90 million booked for the corresponding period in 2016. According to the company, “Revenues from our manufacturing operations grew 40% in the period while supermarket sales increased by 9%. Export sales of manufactured products were up a very strong 66% while domestic manufacturing sales increased by 15%.” Revenue from the manufacturing segment amounted to $296.53 million compared to $212.51 million in 2016. Cost of sales increased 21% to $347.17 million (2016: $287.81 million). As a result, Gross Profit grew 27%% to $108.98 million (2016: $86.09 million). Other income for the quarter fell 59% to $6.87 million compared to $16.89 million reported in 2016. Administrative Expenses increased by 34% to $42.95 million for the first quarter ended December 2017 relative to $32.17 million for the same period of 2016. Sales and Marketing cost increased by 16% for the quarter relative to 2016 closing at $9.58 million (2016: $8.23 million). There was a 51% reduction in finance cost moving from $9.13 million in 1st Quarter 2016 to $4.49 million in 2017. Total expenses finished with an overall 15% increase. Pre-tax profits climbed by 10% for the 3 months ended December 2017, compared to same period for the 2016, increasing from $53.46 million to $58.83 million. JAMT incurred tax expenses of $7.53 million compared to $6.30 million during the 2016 comparable period. Despite the increase in taxation, Net Profit from continuing operations rose by 9% to close the quarter with $51.30 million (2016: $47.16 million). Loss from discontinued operations amounted to $840,863 relative to a loss of $1.32 million. As such net profit for the quarter a totalled $50.46 million versus $45.84 million booked for the comparable quarter ended December 31, 2016. According to JAMT, “the increase in profits this quarter was less than the increase in sales due ,in part ,to the realization of lower gains from our investment portfolio than in 2016 and a reversal from an unrealized exchange gain on our net foreign currency assets last year to an unrealized loss this year due to the revaluation of the local dollar. We also incurred certain non-recurring costs from the closure and sale of KIW’s warehouse operations during this quarter. Net Profit attributable to shareholders amounted to $51.88 million (2016: $45.84 million), a 13% improvement year over year. Consequently earnings per share increased to $0.076 compared to $0.067 for the corresponding period in 2016. The twelve month trailing earnings per share for the company amounted to $0.29. Additionally, JAMT stock price close the trading period on February 12,2018 at $4.60. As at December 2017, the company’s assets totaled $1.61 billion, an increase of 21% compared to the $1.33 billion reported as at December 2016. The growth was driven primarily by increases in Investments, which moved from $189.05 million as at December 31, 2016 to $319.22 million. ‘Investment Property’ and ‘Receivables’ also to the overall increase with a 102% and 25% increase respectively to close at $193.98 million (2016: $96.23 million) and $303.97 million (2016: $243.78 million) respectively. Shareholders’ equity amounted to $1.11 billion as at December 31, 2017 (2016: $934.17 million) resulting in a book value per share of $1.63 (2016: $1.37).